Whether they are about a specific area of study or just for fun, questions are a terrific way to get kids thinking critically and creatively. You probably already use questioning as part of your teaching – the Socratic Method. You probably also use them to generate discussions and as journal prompts. 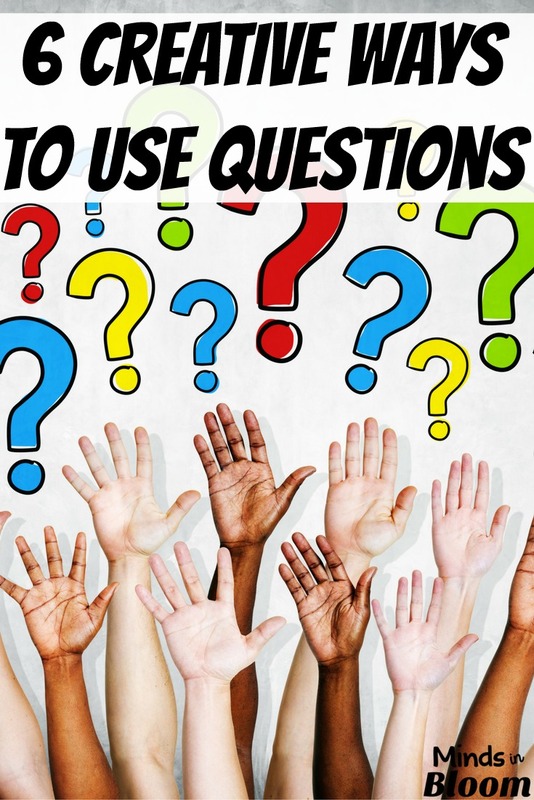 Here are a few other creative ways to use questions. It can be very useful to have students fill out questions about how they feel about school, favorite subjects, areas of strength and weakness, etc. at the start of the year. Another thing that is fun to do is to have students write the answer to some opinion questions – favorites, for example, at the start of the year and then have them do it again at the end of the year. Kids enjoy seeing where they have changed. Use a Would You Rather Question (you can get 20 of them here for free) or any other question with two or five or so choices. Students can vote with their bodies, by moving to a part of the room, with hands, or by moving name tags. From there you can have students discuss their positions and see if anyone changes their mind. Or you can analyze the data. A good poll question has 3-5 answers. You can make it relevant to a holiday (which of these five choices is your favorite Halloween treat?) or a topic of study (which of these four dinosaurs is your favorite?). For homework students can collect data from 20 or more people over a few days or a week (categories with tally marks work well). You then have some wonderful data with which to work. Students can use graph paper to make a bar chart or Excel to make any number of different charts. Students can then answer questions about their charts and compare them to their classmates’ charts. You could also combine all the data to make one large class chart. Brainstorming a list of questions about an area of study before you begin the unit is a great way to get kids interested in the topic. It also tells you what they are wondering about. You can use the list to partially guide the unit, or send individual students or small groups on quests to find the answers to specific questions. At the end of the unit, go back to your questions and see how many for which you have found answers. Have students make a T-chart: Fact Questions on one side, Opinion Questions on the other. For each side they must write a given number of questions. Have students write a question starting with each of these words: Who, What, Where, When, How, and Why. Have students write questions focused on specific story elements: setting, character, plot, theme, etc. Have students write questions that they know will be used in discussion. Have students try writing true/false and multiple choice questions. Have students write questions they would like to ask the author. 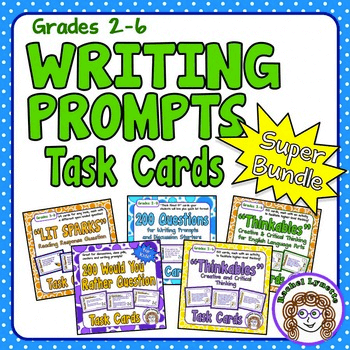 You can get 64 reading response question cards that will really get your students thinking right here. Having students pretend to be a character from a book they are reading, or a famous person, and then answering questions interview style can be a great way for them to really think about that person or character’s feelings and opinions. Generating questions before a unit can activate their prior knowledge which forces them to analyze what they have learned in the past. Nice post, good ideas. So glad I stumbled upon this post. As usual, more to pin! Love your suggestions. Love questions! May I add, I have noticed that, whenever possible, if I can ask boys what they think about something and girls how they feel about that same thing, I get the best answers and most enthusiasm. I realize this little wording switch up isn't possible with written assignments, but still, questions can be kind of fascinating. Don't you think? Oh wait, that's a question.